• Sunday afternoon "Gleeman and The Geek" will be broadcasting live from the Minnesota State Fair at the KFAN booth near the grandstand. We're doing an extended two-hour show from 4-6 p.m. and there are bleachers set up so people can hang out, eat food, and watch the show, so it would be great to to see some podcast listeners and blog readers there. 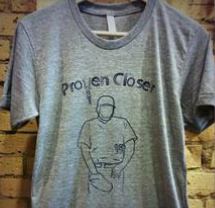 As you can see, in addition to the "proven closer" label it also features a sketch of Perkins zipping up his fly, which he did mid-save earlier this season. I think it's a funny shirt being sold to benefit a great cause by a pair of good people, so I highly encourage everyone to join me in buying one. UPDATE: I think this midnight conversation shows everyone's true colors perfectly. • I defy anyone to find a better video of me hitting a milk carton for home run with a bowling pin in someone's kitchen. • Remember the various fake movies that were featured in "Seinfeld" like "Rochelle, Rochelle" and "Prognosis Negative"? Someone went and made posters for all of them. 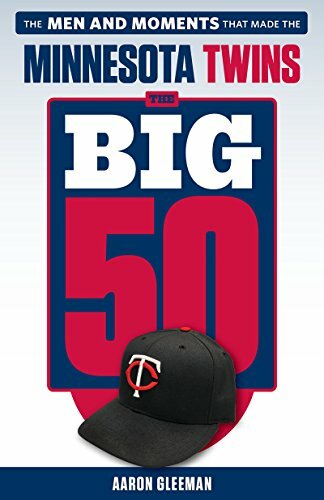 • Does a concussion mean it's time to move Joe Mauer away from catcher? • Every row of this picture from 2001 adds a new dimension of fun. Row 1: Britney Spears and Justin Timberlake. Row 2: Jennifer Lopez and Chris Judd. Row 3: Jimmy Kimmel, Triumph The Insult Comic Dog, and Carson Daly. Row 4: Fred Durst. What a time to be alive. I started blogging the next year. • I've been conducting similar experiments for years, but a lot more data needs to be collected. • I'd love to hear the story being told by the guy in the middle wearing a Twins jersey. Based on his act-out and the reaction of the woman sitting next to him it seems like a great one. • Reds second baseman Brandon Phillips freaked out at a reporter and angrily mocked him for one of the few physical traits that society hasn't deemed off limits. • On a related note, I really liked Will Leitch's article about the athlete/reporter power struggle. • I have a couple openings in my "Hardball Dynasty" league on WhatIfSports and the new season begins next week. If you're interested in joining, please read this first. • My favorite scene from this week's "Breaking Bad" was the waiter offering table-side guacamole during an extremely tense meal, so imagine my delight when the actor, Guy Wilson, reached out to me via Twitter to say he's a fan of my writing. Worlds colliding! • GIF magic, starring Troy Tulowitzki and Jose Fernandez. • As mentioned on this week's "Gleeman and The Geek" episode, I hung out in Uptown until 4:00 a.m. Saturday night. Part of the festivities involved seeing Vikings fullback Jerome Felton at Bar Louie around 1:00 a.m. He couldn't have been nicer to my group of drunken doofuses, answering stupid questions about Christian Ponder and, as the bar closed and we exited together, giving out high-fives and hugs. And then 36 hours later the NFL suspended him for substance abuse. • I had a discussion about this topic Saturday night, so this website comes in handy. 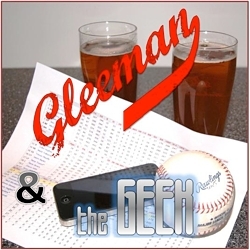 • In addition to recapping my late evening, on this week's "Gleeman and The Geek" episode fill-in producer Kate Butler set me straight about what may or may not be a turn-on for women. • Michael Baumann of Grantland wrote a good article about Justin Morneau that captures a lot of my same feelings on the subject. • Marlon Byrd was traded by the Mets on "Marlon Byrd t-shirt night." • I'm very late to the party, but after recently discovering Jason Isbell's music I've downloaded every song and am pretty much listening to him non-stop. He's coming to Minnesota in October to play the Varsity Theater--where I saw stand-up comedians John Mulaney and Carmen Lynch be hilarious this spring--and I think we should all go. Together, even, if you know me in real life. • Just missing the cut at No. 25: "Wanna try to get a date on the radio at the State Fair?" • St. Cloud Rox employee Michael Johnson found some footage of our party bus outing in June. • This week's reminder that I went to journalism school. • One of the more mind-boggling responses to criticism that I've ever seen: "I've got a wall full of plaques from various writing awards in my home office. If you'd like I can list them for you." • Alan Sepinwall interviewed "Parks and Recreation" creator and former baseball blogger Mike Schur about his new show, "Brooklyn Nine-Nine." Schur is great and the cast includes longtime AG.com favorites Chelsea Peretti and Andre Braugher, so I'm really looking forward to it. • As usual, I feel the same as Larry David. • Alex Karpovsky is one of the best things about "Girls" on HBO and Netflix just added a few of the movies he wrote, directed, and starred in. Definitely worth checking out. - "Whatever happened to Joel Zumaya?" - "Heavy guy diet failure"
- "Why did the Twins sign Mike Pelfrey?" - "Gilbert Gottfried depressed on Howard Stern"
- "Dana Wessel and Randball's Stu obsessed with Link-O-Rama"